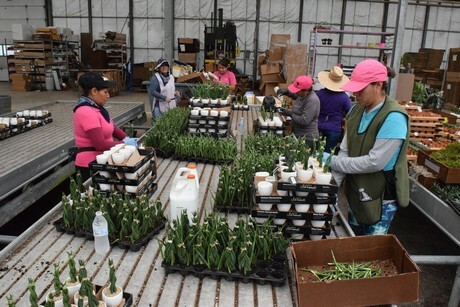 US (FL): "We grow fast, faster than our space allows us to"
"We grow fast, faster than our space allows us to", says Pieter Mertens, Production Manager at the Deroose Plants & Exotic Plant in Apopka (FL), USA. For this reason, this young and finished plants supplier is looking for opportunities to expand their 3.6 ha nursery in the near future. Last month, we paid a visit to this rapidly expanding business. 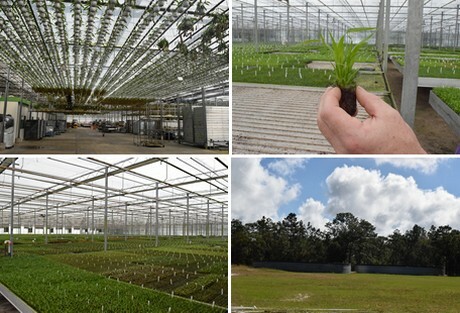 The story of Deroose Plants Inc in Apopka, Florida started in 1994, where they opened a facility just 13 years after their establishment in Belgium, by Reginald Deroose. They started in a rented low tech greenhouse and purchased a second location greenhouse quickly afterwards. In 2001, they built a 3.7 ha glass greenhouse while Mertens joined the company. They were among the first in the area to establish a high tech glass greenhouse (built by Dalsem). "At first, the community was against the construction of this greenhouse, but after winning the Environmental agricultural award of Florida for the capture and re-circulation of rainwater, the community became quite proud of the new greenhouse." Next to their 3.7 ha greenhouse, they also grow under a 3 ha shade house and 0.3 ha double poly house in the area. Clockwise from top left: Nepenthes hanging from the ceiling in the processing area; a bromeliad tissue culture clump ; two rainwater silos; a look in the greenhouse. 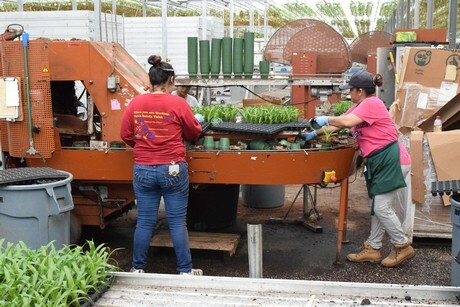 At their location in Apopka, half of the greenhouse is filled with young plants that they sell to other growers and half with finished plants that they sell to brokers. Since the establishment of their own greenhouse, they have seen the demand increase. 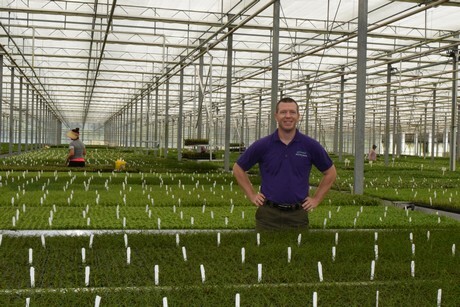 "We saw excellent results regarding the quality of the plants grown in the glass greenhouse", says Mertens. Sometimes Florida gets plagued by a hurricane, Deroose built their glass house with a wind load of 110 miles per hour, in case of hurricane. Several other plant growers sustained severe damage while Deroose just continues their business . In 2008, during the financial crisis in the US, Deroose also received a dip in sales, but - as the economy improved - it started to increase again afterwards. Later Deroose was acquired by a large company Siat based in Belgium that produces rubber. And with the acquisition of Exotic Plant in 2017, their customer base expanded even more. The acquisition of Exotic Plant also increased the range of products. Currently, the assortment consists of bromeliads, succulents, phalaenopsis, spathiphyllum, carnivorous plants, grasses, Kalanchoe, alocasia, canna, calathea, anthurium, cordyline, zanthedeschia, curcuma and more. Even though Deroose utilizes quite a few techniques and machines in the greenhouse, the rooting process is still done manually. "We have a very large assortment and there is no machine yet - or we have not found it yet - that can handle so many different varieties." 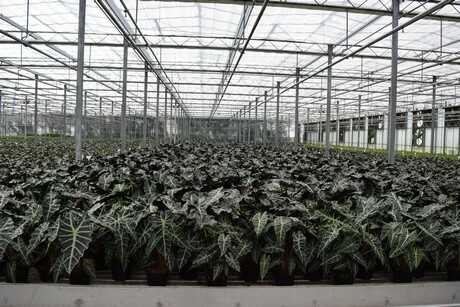 Deroose Plants is known as the world's largest Bromeliad young plant supplier, and bromeliads still take up the largest part of the production area. 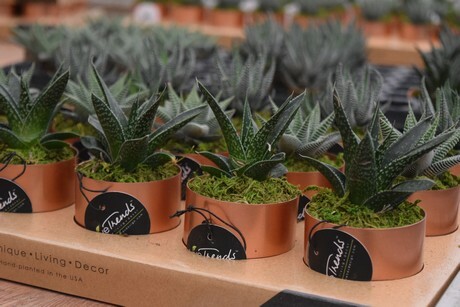 However, over the last years, the production of succulents has increased drastically. "About five years ago, we did not have any succulents in the greenhouse, and now, a third is filled with succulents." And half of the succulents are sold in added value pots. As the demand is growing fast and DeRoose cannot meet it with the current available space, they are looking for opportunities to expand. "At this location, we can increase the greenhouse acreage by a third and we will probably buy or rent another greenhouse." Next to Belgium and the US, DeRoose Plant also has a production facility in China. Most of their tissue culture comes from this Chinese facility and is being rooted and grown at their facilities. The Deroose Plants China company supplies the assortment worldwide. In Belgium, the new varieties are started up in tissue culture as that's where their R&D department is situated. The breeding work lies with several breeders spread over the world .